Thanks to their luxurious long skirts, these floor-length pleated dresses can really make the most of this exquisite trend. One that we particularly love is the Londyn floral printed satin gown by Amur. The fitted bodice offers a delicately shaped sweetheart neckline and elegant thin straps. This perfectly shapes and flatters your figure whilst contrasting with the voluminous, tiered pleated skirt. This dress makes a great impression providing drama from the skirt and the stunning black floral printed satin. Styling this dress with heels will ensure a showstopping final look. Your entrance will be positively unforgettable in the Tiara bustier green gown by Maria Lucia Hohan. The incredibly vibrant shade of green combined with the semi-sheer skirt and strapless corset bodice will demand attention. The sweetheart neckline adds a delicate feminine touch whilst the mesh skirt fabric swishes romantically as you move. Gold heels and jewellery will compliment and elevate this look perfectly. When your event calls for sophistication yet a full gown seems too much, these pleated dresses are simply ideal. The gorgeous plunge pleated midi rose dress by Asos Design is a prime example. 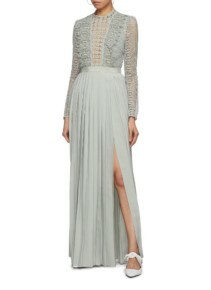 This dress offers delicate lace trims on the plunge neckline and waist and pleating on both the skirt and shoulders. The classic fitted bodice and A-line skirt pleats then provide a timeless cut and a truly flattering shape. 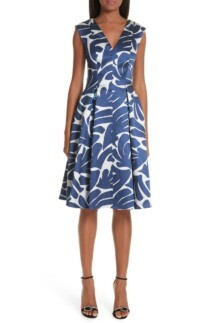 For such a beautiful fit and design it has an unbelievably reasonable price tag also. Style this with heels and a delicate clutch bag for your next evening engagement. 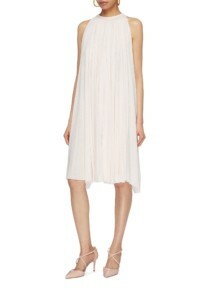 For an alternative take on pleats, we highly suggest the jersey sleeveless pleated dress by Esteban Cortazar. Pleats glide smoothly from the gorgeous high neckline all the way to the hem creating a chic swing silhouette. Heels and a simple up-do will ensure all focus is on the perfectly constructed pleats and elegant neckline.